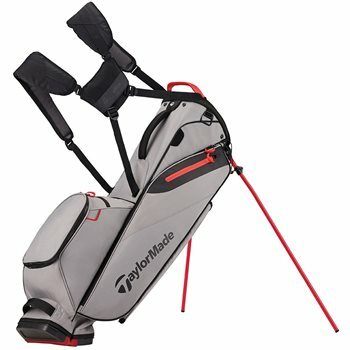 The TaylorMade FlexTech Lite stand bag is lightweight at 4.5lbs and features the patented FlexTech stand system which is a smooth release, collapsible base system to ensure there is no club crowding or sticking. The bag has 8 pockets which include a water resistant pocket with micro-suede lining to keep your valuables protected from weather and scratches as well as an easily accessible insulated water bottle pocket. The dual density comfort strap utilizes two materials for added comfort and stability. Better bag than the Hoofer, colors look great, very well built with lots of thought put into the design and materials. Cant imagine needing to buy another bag for several years.